I met Kathryn Hornick through my stylist of many years, Justine Hornick. Both sisters work for Root Salons, and both are incredibly talented. I’ve been a TrendVision model for each of them, most recently for Kathryn. The younger part of this dynamic duo, Kathryn is so enthusiastic for her profession. Her creativity seems endless, and she’s not afraid to push boundaries. I admire her for that! Read on for more about this brilliant artist. Stylist Kathryn Hornick of Root Salons and Wella Professionals works with a model at a hair competition. Hey Kathryn! Tell us about you. I grew up in Green Bay, Wisconsin. It was on the edge of town, surrounded by woods on one side and fields on the other. To this day, I first look to nature for inspiration. It’s hard not to when that’s all you really knew. I started at Aveda Institute Minneapolis in September 2010 and graduated in June 2011. I skipped out of my graduation ceremony that July, when the rest of my classmates finished. Instead, I enrolled at Sassoon Academy Chicago for a four-week intensive program, and then I started working at Root. I’ve now been at Root for two years. I started in our St.Paul salon, assisting my sister, Justine, before assisting the owner, Jim Koktavy. I was an assistant in St. Paul until December 2011, then Root Salons opened its second location in the Linden Hills neighborhood in Minneapolis. I became the first assistant under Jim, and began building my clientele that month. I reside in Minneapolis—I just became a new resident in Uptown, trying out “apartment life” on my own. Besides being a stylist at Root, I am a hostess at Jax Cafe (EDITOR’S NOTE: Beware of music on home page) on the rare days when I’m not traveling and working for Wella Professionals. I’m an Independent Contractor for Wella, and I’m hoping to get more into educating for the company, but as of now, I am assisting backstage at hair shows and events. How’d you end up at Root? Tell us about your accomplishments. Some of my accomplishments started when I was in beauty school. Under the mentorship of Justine, I entered America’s Beauty Show’s Student Competition in spring of 2011 under the Wella category. I had to choose a trend from one of the four categories and interpret it in my own way. I used my other sister, Stacey, as a model, and entered two weeks prior to the competition. I ended up being a finalist and competed live in Chicago. We took first place! From there I was able to compete in Wella’s national TrendVision competition in Los Angeles in September 2011. I was able to use the same model and trend, and we walked away with the bronze award. In 2012, I became a part of Team I.C.A.N. We were a team of five and competed, being fueled by Sebastian, in Orlando, Florida, at BehindTheChair.com’s RAW competition. Competing against seven other manufactures in the U.S., we took first as the youngest, “rawest” team! It was probably one of the greatest experiences I have had thus far. I feel grateful for having been a part of it. As a team, we have had the awesome opportunity of being on two industry magazine covers, and being the featured spread in both (BehindTheChair.com Magazine and FirstChair.com Magazine). 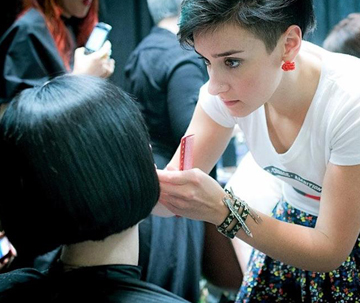 TrendVision is a regional, national, and international competition that’s annually put on by Wella. There are four haute-couture trends released yearly for stylists to interpret in their own way. You choose a trend, find a model, create the look, and shoot with a photographer to submit a photo at the national level, with the hopes of becoming a finalist. You are judged on the overall look, but especially on the hair. If you win at the national level, you’re then a finalist for the international competition and compete against roughly 100 other countries. I was able to compete at the national level as a student, and took third place with the trend “Polaris” in 2011. I feel very fortunate to have known my mentor since birth! Justine took me under her wing ever since I announced that I planned to follow in her footsteps. It was very helpful to have her to go to, to compare experiences through beauty school, or swap inputs. I couldn’t ask for anyone better; someone who isn’t afraid to tell me how it is or push me past my limits. Who in the industry do you admire? Someone who I had admired since beauty school is Stephen Moody. He started his career following in his mother’s footsteps and trained with one of the greatest in the world, Vidal Sassoon. I first met Stephen when I won America’s Beauty Show Student Competition in 2011. I was so nervous and flabbergasted with how humble he was. I was able to take one of his last classes at Sassoon Academy before he left and became the Dean of Education for Wella. Now I get to work with and around Stephen at events for Wella, and I couldn’t feel any more blessed. Sign up for my monthly emails, redshoes news, here! I’m going to be in TWO places at one time this weekend! Well, my artwork will be, anyway. If you’re in the San Francisco area, you can find me at Renegade Craft Fair at the Fort Mason Center Festival Pavilion in the Marina area. I’m going to be there from 11am – 7pm on both Saturday and Sunday. I’ll have lots of California State Icons for you to peruse, as well as Icons from all of the other states I currently carry. If you’ll be closer to the East Coast instead, you can pick up a State Icon or two from my friend Josh, who is selling for me at Newport Folk Festival in Newport, Rhode Island. I’m disappointed to be missing the great bands that will be playing this weekend, but am happy that I have a friend who can enjoy the music and help me out. I look forward to seeing you, or for you to check out my artwork! See you this weekend, Los Angeles! I’m packing today and finishing up some last-minute (as always) California-specific State Icons. I can’t wait to see you at Renegade! Will you be in the Los Angeles area this weekend, July 20-21? If so, come see redshoes26 among the 250-plus creative peeps at the Renegade Craft Fair, which is taking place at the Los Angeles State Historic Park. We’ll be there both Saturday and Sunday from 11am – 7pm. See you there! Hey, Minnesotans! I know a lot of you are or will be “up north” this summer at your cabins or just hanging out. 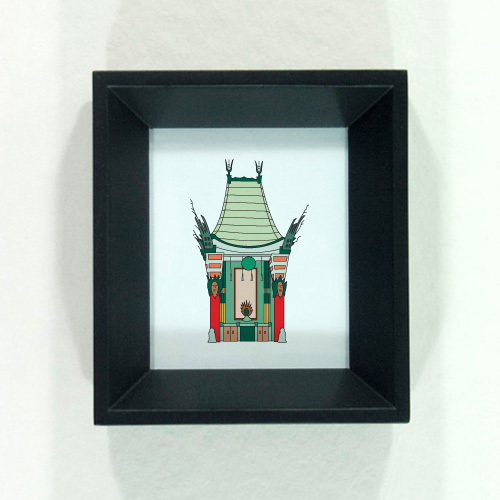 If you’re in the Brainerd area any time between July 5-31, check out the cool, Minnesota-themed juried exhibition, “Minnesota, Marvel” at Franklin Arts Center‘s Resident Artists Gallery. You’ll see the work of local artists, including me! 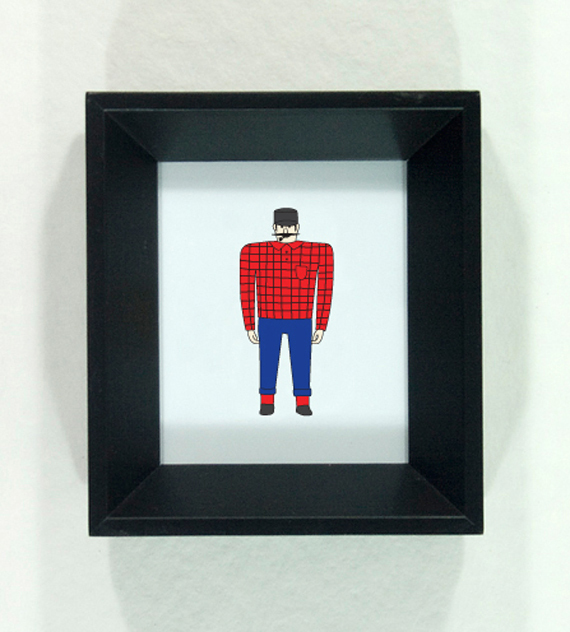 My Paul Bunyan Statue, Babe the Blue Ox Statue, and Mickey’s Diner illustrations are all part of the exhibition. Here’s all the info you’ll need. Have a great holiday weekend, everyone!